Medical imaging plays an important role in clinical management of patients with cardiac diseases and in preclinical and clinical research. The recent availability of hybrid PET/MRI devices that combine positron emission tomography (PET) with magnetic resonance imaging (MRI) opens up new opportunities. Technical advancements have been necessary to make the two systems with different underlying principles work well together. 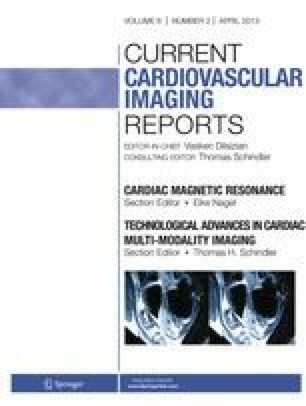 Growing evidence points to a significant value of this novel modality for imaging of the myocardium and the coronary arteries in order to gain broad insight into the morphological, functional, molecular and cellular aspects of cardiac pathophysiology. PET/MRI can deliver the combined information of stand-alone PET and MRI with improved spatial and temporal co-registration; it can additionally be used to improve PET image quality and quantification accuracy by addressing factors such as motion and partial volume effects, making PET/MRI more than its parts. An erratum to this article can be found at http://dx.doi.org/10.1007/s12410-013-9210-8. This work was in part supported by the Deutsche Forschungsgemeinschaft, SFB 656 Münster (project C6) and by the Herzzentrum Münster e.V. (travel grant). World Health Organization. The global burden of disease: 2004 update. World Health Organization, Geneva. 2008. Available at http://www.who.int/evidence/bod. Gerretsen S, Kessels AG, Nelemans PJ, et al. Detection of coronary plaques using MR coronary vessel wall imaging: validation of findings with intravascular ultrasound. Eur Radiol. 2012. doi: 10.1007/s00330-012-2576-1.